the route follows the Pyrenean Foothill Route up to Lourdes. 15 days of walking with some challenging stages when you approach the Pyrenees passes. Some of the stages can be adapted to be easier : ask for more information! During this walk you may not meet many pilgrims as on the Puy Route or the Camino Frances but you will discover the walk off the beaten paths in France. A few highlights on your way : Carcassonne on the Unesco List, Saint Lizier, Saint Bertrand de Comminges and of course Lourdes and the famous grotto and sanctuaries. The trip starts at the medieval city of Carcassonne. This fascinating walled town with its 2 circular walls and huge medieval fortress--the largest in Europe--was added to the UNESCO World Heritage Site list in 1997. CARCASSONNE to MONTREAL - 23 km/15 mi – 5h30 of walking. After the bustling city, you will enter a peaceful countryside area, with vineyards and crop fields. The way is well waymarked and you will easily find the village of Montreal perched on top of the Mont Royal. Today you will cross the plain of Lauragais and go through circular villages as Cailhavel and the perched village of Fangeaux located in the Cathar Country. A short walking day which will give you the time to visit the medieval Mirepoix and admire the half timbered houses, the Consul House and even the imposing Cathedral. A short stage to reach the city of Pamiers (15000 inhabitants) along the river Ariège and the classified canal enclosing the city. PAMIERS to LE MAS D’AZIL 27 km/15 mi–7h00 of walking. 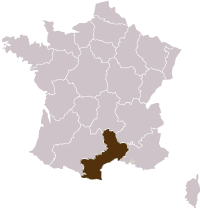 The region called « the Small Pyrenees » on small peaceful roads or footpaths links Pamiers to Le Mas d’Azil. Night in a hotel. LE MAS D’AZIL to SAINT GIRONS / ST LIZIER 26 km/15 mi – 7h00 of walking. ST LIZIER / ST GIRONS to ARGEIN 16 km/10 mi – 4h00 of walking. A short transfer up to saint Lary , the ski resort, you will cross the Aspet Pass and walk through “lauze” stone roof villages and have a break in Couserans before arriving at Juzet d’Isaut where you will send the night. ST BERTRAND DE COMMINGES to LA BARTHE DE NESTE 24 km /16 mi– 6h00 of walking. The walk today will take you to Nestier at the foot of the Mont Arès. There is a remarkable calvary and a 16th century Church. The route continues by Montoussé and its 17th century Church and medieval castle. The stage ends in La Barthe de la Neste. Night in a hotel. A long stage winding its way to the heart of the Baronnies and many typical hamlets and small villages nestled into the Pyrenean foothill. The stage ends in Bagnères de Bigorre a charming lively Spa town where you will spend the night. Night in a hotel. BAGNERES DE BIGORRE to LOURDES 29 km/16 mi – 7h15 of walking. From the healthy waters of Bagnères to the miraculous waters of Lourdes, this stage is a long walk to reach the Pilgrimage City, the Grotto, the Sanctuary,the imposing castle and the 35 places of cults of the Holy City. Night in a hotel near the Sanctuary. Hotels and Guest Houses (2 and 3 star hotels and Guest houses). Half board from dinner day 2 to breakfast day 15. Dinners and breakfasts are in your accommodation and are "table d'hotes" with other guests. A road book in French with the description of your program and full detailed walks with a walking map.